Check our News & Info page to get the lowdown on what's up in Las Vegas and read tomorrow's history, today. Time Frame: All tests were conducted between 1951 to 1992. Location: Nevada Test Site, now referred to as the Nevada National Security Site (and formerly the Nevada Proving Grounds), approximately 65 miles northwest of Las Vegas in Nye County. It is operated by the Department of Energy and covers an estimated 1,360 square miles of desert and mountain terrain. Number Of Tests: 928. 100 of these tests were detonations in the atmosphere which produced mushroom clouds visible in Las Vegas and California. The remaining 828 tests were conducted underground. Effects: Las Vegas experienced noticeable seismic effects, visible mushroom clouds and bright flashes on the horizon. As a result, the tests became tourist attractions with the best views coming from downtown hotels. 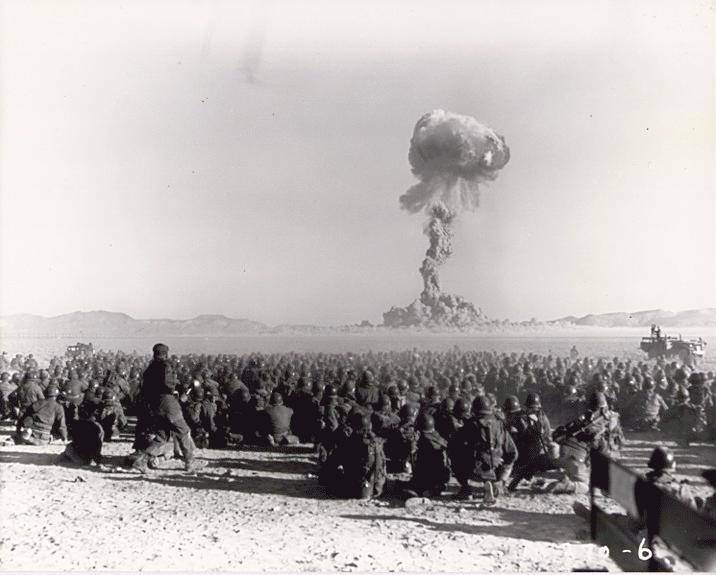 Operation Plumbbob: In 1957, a series of 29 tests were conducted over several months. Amongst them, Hood, the largest atmospheric detonation in the continental United States at 74kt, a two-stage thermonuclear test. In comparison, the Hiroshima bomb "Little Boy" was the equivalent of an estimated 10,000 - 15,000 tons of TNT. The most recent North Korean nuclear test on September 3, 2017, was an estimated 120kt. 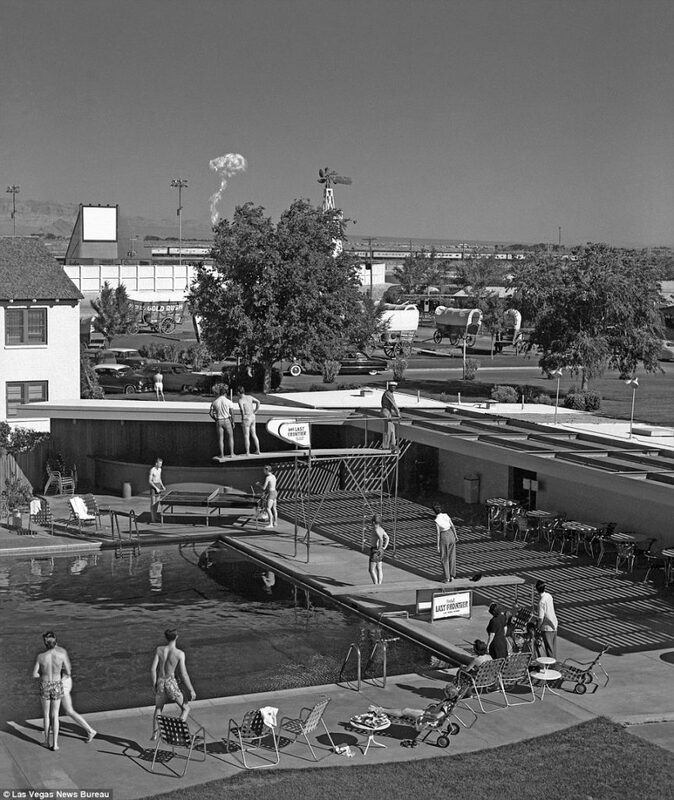 Swimmers and sunbathers at Old Frontier Village watch a distant mushroom cloud from the NTS. Survival Town: Also known as Survival City, was located in Area 1 of the NTS. Tests were conducted to gauge the effects of nuclear blasts onto civilian structures. With other constructed areas, they were collectively known as "Doom Towns." Fallout: St. George, Utah received the worst of the above ground testing due to prevailing winds. An increased number of cancers occurred between the early 1950's and 1980. Protests: From 1986 to 1994, over 500 anti-nuclear protests occurred at the NTS involving over 33,000 protestors and 15,000+ arrests. A nuclear test lights up the early morning sky. Nuclear Bombs Were Being Tested Less Than An Hour From Las Vegas - And Howard Hughes Tried To Stop It. Never-Before-Seen Videos Show Nuclear Weapons Being Secretly Detonated In The Nevada Desert. Interested in reading more Las Vegas history? Check here or register and let's chat in our forum! Previous Previous post: Scene analysis: The Woodsman – empathy done right.